These tricolored popsicles consist of two layers of strawberry purée separated by a layer of milk kefir dotted by blueberries. A special treat that is packed with nourishment: vitamins, food enzymes, beneficial bacteria, healthy fats and antioxidants. And they’re perfect for 4th of July celebrations. Popsicles like this tricolored version for the Fourth of July and this version of homemade creamsicles are favorites among children. Especially among children who consume a nourishing diet that restricts the consumption of processed foods, the inclusion of brightly colored treats like this one help to offer a sense of dietary normalcy. While parents, like me, who avoid artificial flavors and colors can breathe a sigh of relief knowing that the bright colors come from real food as opposed to artificial colorings. Berries are abundant in summer, sweet and bright in flavor. They freeze well, so if you can find them cheaply at farmers markets during the peak of their season, buy them by the case and stock up for winter. All berries, but blueberries and raspberries in particular, are powerfully anti-inflammatory foods and boast an ORAC value of 4,302 to 5,065. The ORAC value rates an individual food’s oxygen radical absorbance capacity, and is a way to estimate that food’s antioxidant capacity. Much of the benefit to berries rests in their high level of anthocyanins – antioxidant pigments found abundance in beets and many other red- or blue-hued fruits and vegetables. These naturally occurring phytonutrients may also provide protective effects against cancer, diabetes, neurological diseases and overall inflammatory disorders. Milk kefir is a cultured dairy food, much like yogurt. Like yogurt, milk kefir is rich in beneficial bacteria and food enzymes. It is also rich in a unique nutrient called kefiran which may account for many of its benefits. Researchers have linked cultured dairy products, like milk kefir, to a reduced risk of bladder, breast and colon cancer. Milk kefir may also prove beneficial not only for achieving and maintaining digestive wellness, but also in the recovery of foodborne illness. You can learn more about its benefits and how to prepare milk kefir here and you can get started making milk kefir here. 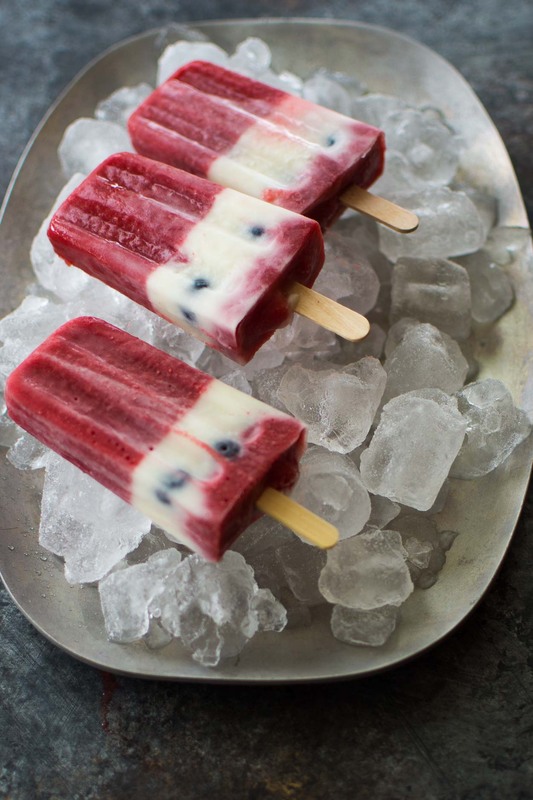 Gorgeous, ripe summer berries blend beautifully with tart milk kefir for an easy, lightly sweet popsicle. 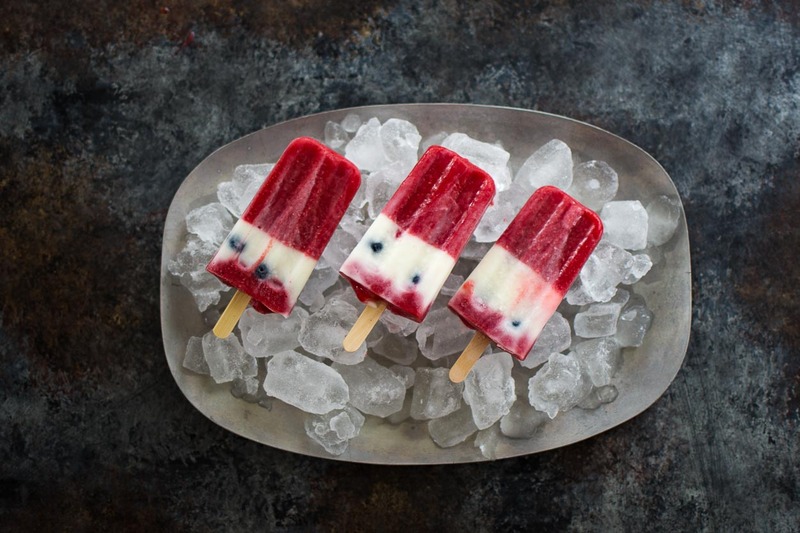 Layers of strawberry purée, partnered with blueberries and milk kefir make these popsicles a visually striking treat for 4th of July Celebrations. Toss the strawberries, lemon juice and two tablespoons of the honey into a high-powered blender (see our favorite here), and purée them together until completely smooth. Pour half of the strained strawberry purée into popsicle molds (like these stainless steel molds), and reserve the remaining puree for the final layer of your popsicles. Freeze the purée in the molds until it's firm, at least 2 hours. Whisk the remaining two tablespoons honey into one cup milk kefir until well-combined. Remove the single-layered popsicles from the freezer and prepare the middle layer by evenly spoon the sweetened kefir into a single layer in the popsicles. Once you've used up all the milk kefir, gently push blueberries into the layer of milk kefir and place the popsicles back into the freezer. Freeze popsicles until the milk kefir sets, about two hours. After the layer of milk kefir has set, pour the remaining strawberry puree evenly among the popsicles, and return them to the freezer until all layers are set, preferably overnight. To unmold the popsicles, hold the mold under lukewarm water for a few seconds until the popsicles release cleanly. If you wish to avoid the endocrine-disrupting chemicals found in many plastic popsicle molds, consider purchasing stainless steel molds (find them here). While more expensive than their plastic counterparts, they are also sturdier and longer lasting. It’s always nice to have a little treat on hand for the kids or yourself during those particularly hot summer afternoons – something to enjoy at the lake, the beach or even the backyward. Blackberry Mint Popsicles combine ripe blackberries with light, mint-infused cream for an utterly smooth homemade treat. Cultured Coconut Mango Popsicles blend cultured coconut milk with fresh mangoes for an easy treat. Blackberry Sorbet is an easy-to-make, naturally sweetened dessert. Does the kefir still have all the live cultures present if it is frozen? Just wondering….I thought I that the active cultures in it would be ruined if it was frozen. No proof of this but just wondering. I know my son would love these! We will have to try them soon. Thanks for the recipe! I can’t find the popsicle molds on the site you link to – it just goes to their homepages and searches for popsicle give no results. Can you please tell me what to search under or give the exact name? Thanks much! I was wondering if water kefir would work and be as beneficial in this recipe. Also I am thinking the same as the woman above. Doesn’t freezing kill beneficial bacteria or is it only heat? Hi, looking forward to making this. At what point do you add the vanilla? Not indicated in instructions.